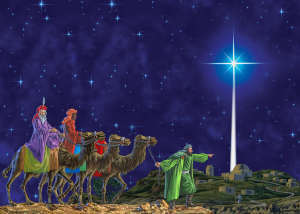 And suddenly the star they had seen rising went forward and halted over the place where the child was. The sight of the star filled them with delight, and going into the house they saw the child with his mother Mary, and falling to their knees they did him homage. Then, opening their treasures, they offered him gifts of gold and frankincense and myrrh.